C.S. 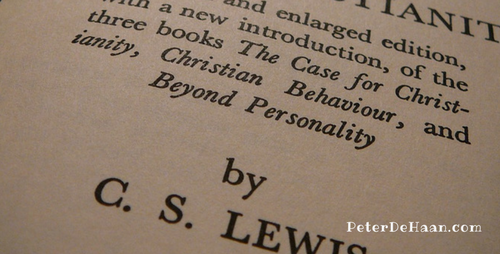 Lewis’s book, Mere Christianity, is based on a series of BBC radio broadcasts in the early 1940s. Initially, published as three separate volumes Broadcast Talks (1942), Christian Behaviour (1943), and Beyond Personality (1944), the works were combined in 1952 to result in Mere Christianity, that is to say, merely expounding on Christianity. The first is “Right and Wrong as a Clue to the Meaning of the Universe,” which aptly serves as a strong foundation on which the rest of the book—and Christianity—is built. The second section, “What Christians Believe,” shows that we have free will to love God or deny Him, but Satan, our enemy, wants us to think we can be like God (which explains all of history). God sent Jesus into the world; his death puts us right with God, yet it evokes a response: change. “Christian Behavior” is the title for part three, which covers practical behavior issues. Doctrine is addressed in the book’s final section. Lewis concludes with the encouragement to “look for Christ and you will find Him, and with Him everything else thrown in,” a fitting conclusion to this intellectual treatise on what is merely Christianity.